If you were concerned about the legacy of "The Thin Man" being shown the proper respect, it sounds like this project is souring fast. Billy Ray ("State of Play", "Shattered Glass") has been hired to take a crack at the script for "The Thin Man," according to The Hollywood Reporter. He follows in the footsteps of Jerry Stahl ("Permanent Midnight", "Bad Boys II") and David Koepp ("Angels & Demons", "Ghost Town"). We're huge "Thin Man" fans, and Depp's a great choice (if you just have to remake this film). But Depp's choice of Rob Marshall to direct gave us pause (pause turned to rage after we saw "On Stranger Tides"), and the fact that the project is now on its third screenwriter makes us very nervous. But what was even more disheartening was the news that Marshall wants to ad a couple of musical numbers and give it "a Sherlock Holmes-like stylized treatment." So we've got the director of one of 2011's worst films looking to shoehorn musical numbers into a classic film, they're on writer #3, and the star has said he works so his kids can have money--'tis an ill wind that blows no good. Based on the novel by Hunter S. Thompson, Johnny Depp plays a reporter who moves to Puerto Rico in the 1950s, where he falls for the girlfriend of a sleazy real estate developer. Co-starring Amber Heard, Aaron Eckhart, Giovanni Ribisi and Richard Jenkins, opens Oct. 28. 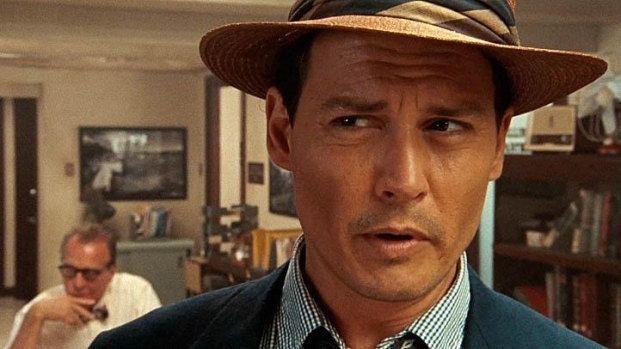 Last week Depp signed on for a Dr. Seuss biopic, and can next be seen Oct. 28 in "The Rum Diary," based on the Hunter S. Thompson novel about an American journalist living in Puerto Rico during the late '50s.